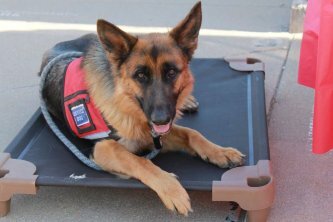 We provide funding for disabled Veterans to purchase a specially trained k9. This helps Veterans overcome physical handicaps and/or PTSD related symptoms. 22 veterans take their own life every day due to PTSD related symptoms. These men and women have endured the ultimate sacrifice to protect our free nation and it is our responsibility to provide a healthy environment for our heroes when they return home. We are on a mission to offer our veterans an effective and cost-efficient support system that will heal and assist them in their return to civilian life. the solution is already proven, as service k’s have outstanding results in lowering PTSD symptoms and helping the disabled through daily activities. If you are a disabled veteran- from any war, we will pay for the cost of a service dog specially selected and trained for your needs. That's no cost to you, it is absolutely free. Call 316-200-6758 to donate or apply for a therapy dog today.